Everyone is happy to see spring and summer, especially if they live in areas where winter cold is typical. From outdoor sporting events and family picnics to gardening, walks, and more, there are so many activities and fun times outdoors. However, warmer weather also means taking certain precautions toward health and safety, especially when it comes to aging adults. Family caregivers and elderly care aides should incorporate some healthy tips to dealing with warmer temperatures and aging adults. Here are a few things that can make a difference in how an elderly person enjoys the outdoors. It doesn’t matter if it is for ten minutes or several hours, seniors should always wear sunscreen if they are going to be outdoors. With age, the skin isn’t as strong or supple as it once was. When it gets sunburned, it can cause more health issues than if it were a younger adult. Their skin is also much thinner and more susceptible to damage. A strong sunscreen can spare elderly adults the pain and health complications from sunburns. If an elderly person is wearing tight, restrictive clothing, it can affect how their body regulates its own temperature. Choose light colored, loose-fitting clothing, preferably of cotton or other lightweight material. With age, the body has a more difficult time cooling itself down, so appropriate clothes make all the difference. Many seniors are at risk for dehydration because they often don’t drink enough water anyway. 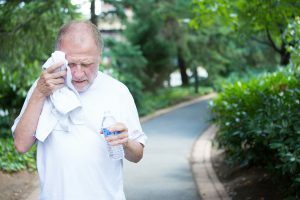 An elderly person’s body doesn’t hold onto fluids as well as it did in earlier years, so seniors lose body fluids more quickly than others might. Staying hydrated is often the best way to reduce the risk of heat stroke. Harsh UV rays can harm people of any age, but seniors are particularly vulnerable. Family caregivers and elderly care assistants should do their best to find a shady spot for the elderly person. If possible, a hat with a wide brim can also help keep the sun away from a senior. There are few things more pleasant that sitting outside on a sunny day when a little breeze kicks in and cools everything down. If an elderly relative is outdoors but wants their own breeze, there are handheld fans that do a nice job. Many of them even include misters so that a fine spray of water lands on the skin. The evaporation process cools them down right away. Elderly adults should not be discouraged from heading out of doors in warmer weather because the activity is always beneficial. However, family caregivers and elderly care assistants can do their part to make sure they are safe and stay healthy. Without precautions, an elderly adult may suffer from sunburn or even heat stroke due to higher temperatures. Just a little preparation and special care for seniors in warmer weather means they can enjoy themselves outdoors without fearing health issues.